Really Big Coloring Books ®, Inc. of Saint Louis, Mo. 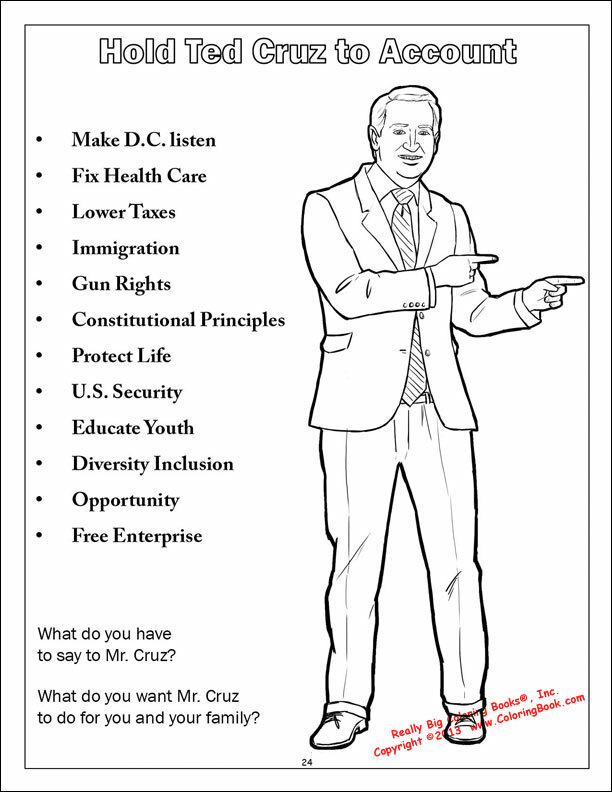 releases educational comic coloring and activity book for youth, parents and teachers which details Ted Cruz’s life, principles, values and mission. Parents have told our company they enjoy modern day heroes and positive role models in children's literature and Mr. Cruz as a sitting U.S. Senator certainly meets the criteria. 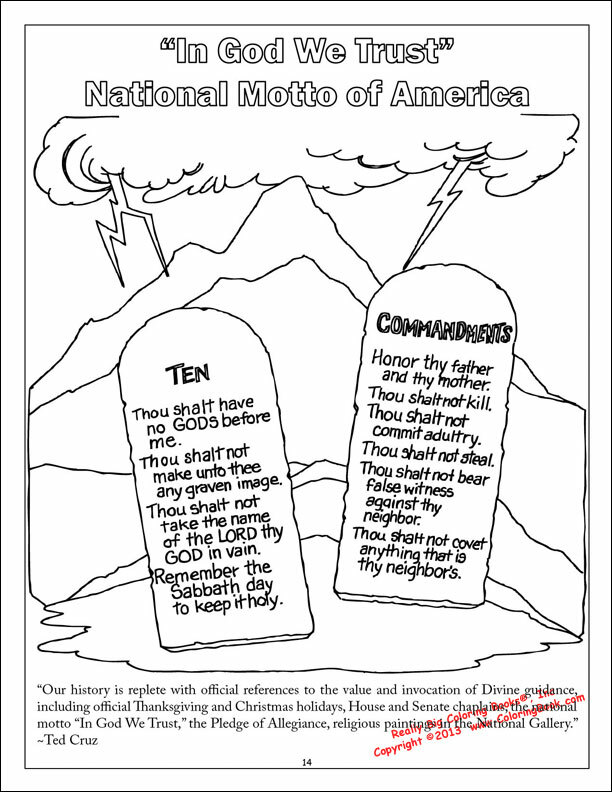 In a continuation of the company's popular series "Tell the Truth - Tell it Often - Tell the Children" designed for all ages to promote positive healthy discussion and understanding, Really Big Coloring Books®, Inc. (RBCB) turns complex challenges or modern issues into a relevant format with an emphasis for youth. 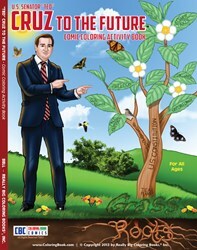 The Cruz to the Future™ book is a non-partisan, fact-driven view of how Texas Sen. Rafael Edward “Ted” Cruz became a U.S. senator and details, through his quotes and public information his ideas for what he believes will help America grow. Cruz has openly identifies with the Tea Party and garners support from the Republican Liberty Caucus and many independents including democrats. The Washington Post calls Cruz’s Texas senate election victory “the biggest upset … a true grassroots victory against very long odds.” Texas Sen. Rafael Edward “Ted” Cruz has become a rejuvenation for the Tea Party movement in the U.S. His 21-hour speech on the Senate floor in September 2013 propelled Cruz into the national spotlight. Cruz’s beliefs and actions stir much emotion in those following the political realm, he is a modern "superhero" to many and looked upon in adoration and abomination by some. 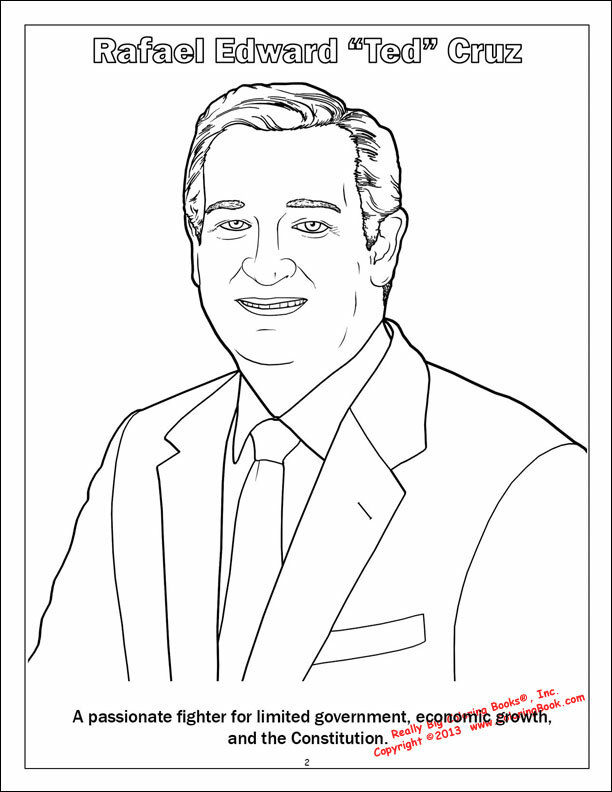 The Cruz to the Future™ coloring book is suitable for any student desk in America, as millions of people across the country admire, respect and portray Mr. Cruz as a positive role model for children, stated publisher Wayne Bell. Parents have told our company they enjoy modern day heroes and positive role models in children's literature and Mr. Cruz as a sitting U.S. Senator certainly meets the criteria," continued Bell. 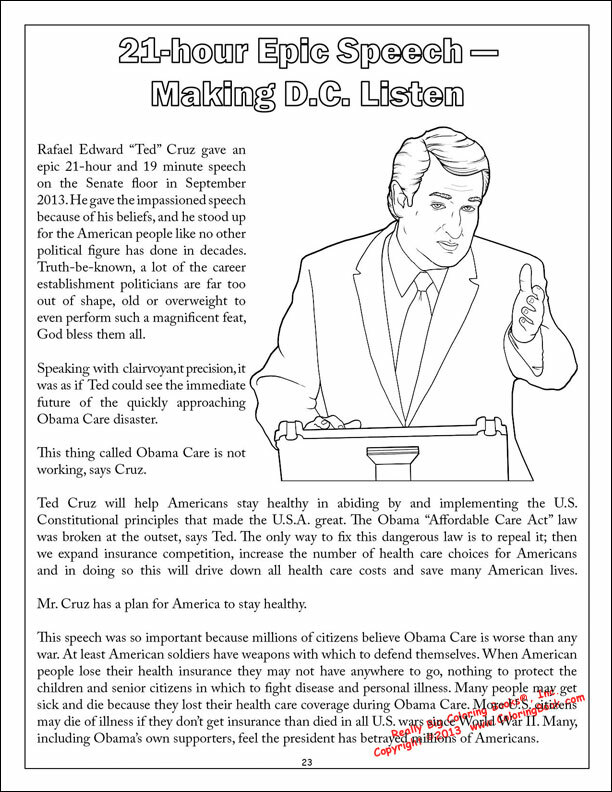 RBCB created this comic coloring and activity book not as an endorsement of Sen. Ted Cruz but rather as an educational tool to be used in schools and perhaps as a handout for groups, clubs and organizations. 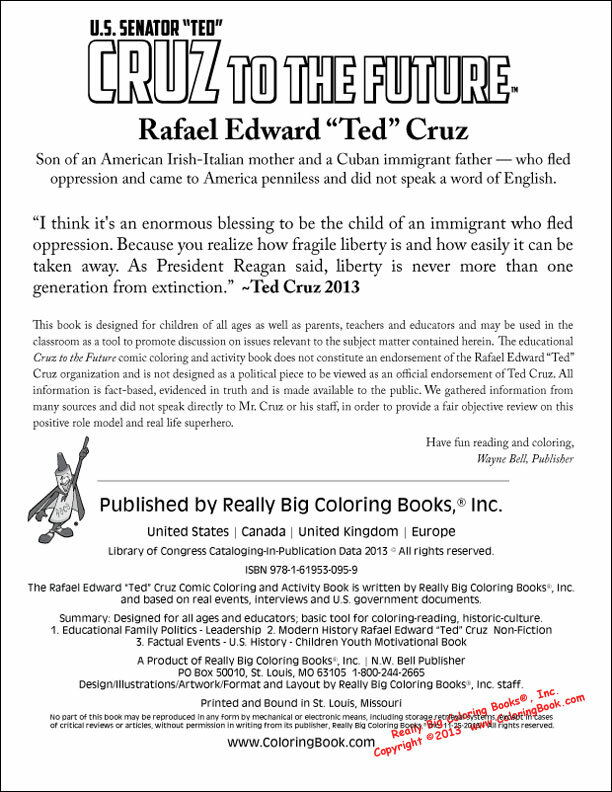 Information to contact Cruz, through both direct mail and social media, is presented at the end of the book. He is a positive role model worthy of study in any school. All information is fact-based, evidenced in truth and is made available to the public. The book is designed for children of all ages as well as parents, teachers and educators and may be used in the classroom as a tool to promote discussion on issues relevant to the subject matter. 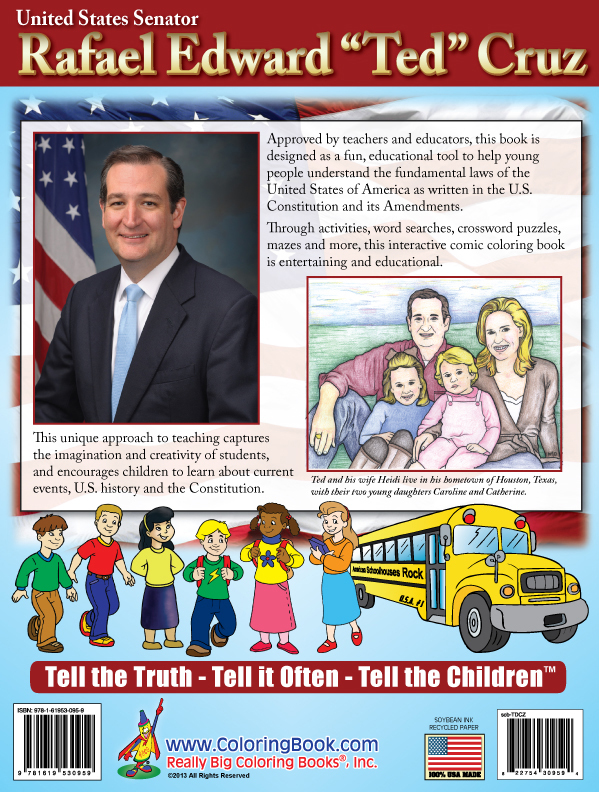 Not only do pages describe Cruz’s early years, education and Tea Party stance in an easy way for parents and educators to explain to their children and students, but crossword puzzles and words searches along with other games and activities provide thought-provoking information and steps for more research. This book displays topics such as small business and the Pledge of Allegiance and Cruz’s views on them. Cruz to the Future™ comic coloring and activity book is now available on RBCB’s website http://www.ColoringBook.com at Amazon.com and soon numerous other retail locations such as Barnes & Noble and Abe Books. The book retails from US$4.99 to US$6.99 dependent upon outlet and wholesale prices are available for groups. About Really Big Coloring Books®, Inc.
Really Big Coloring Books®, Inc., headquartered in St. Louis, Mo., is a multinational company providing quality children’s teaching and learning tools and coloring book products for more than 20 years. Known for its market-leading positions, RBCB’s family of products is classic, colorful and unique. The company owns more than 900 coloring book-related domain names in several countries and is a trend-setting leader in the coloring book industry. For more information, please visit http://www.ColoringBook.com or call 314-725-1452. 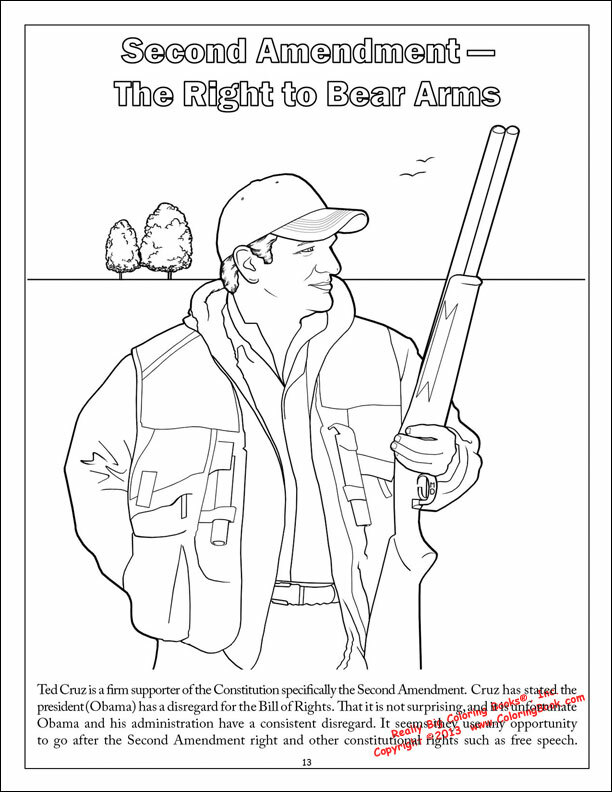 Really Big Coloring Books, Inc.
Ted Cruz and family Cruz to the Future™ Comic Coloring and Activity Book U. S. Senator Rafael Edward "Ted' Cruz Second Admendment - The Right to Bear Arms National Motto of America "In God We Trust" 21 - Hour Epic Speech "Make DC Listen" Hold Ted Cruz to Account.